The only all-inclusive treehouse lodge in the Amazon, delivering a once in a lifetime experience. Treehouse Lodge is located in the Peruvian Amazon at the confluence of the serene and protected Yarapa and Cumaceba rivers near the Pacaya Samiria Reserve. 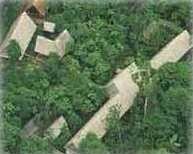 Ceiba Tops is ideal if you have only one or two nights to spend in the jungle. A swimming pool and room service complete the recent improvements. Garden walkways connect each room to the dining room, bar and hammock house. 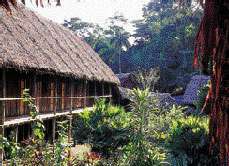 Treks through virgin rainforest and boat trips to neighboring villages are only part of the activities available. Explorama Lodge is nestled in primary rainforest with more than 30 screened rooms and adjoining bath facilities, and is completely illuminated by kerosene lanterns. A variety of hikes and boat trips are at the disposal of the guest including the Seven Bridges Trail. 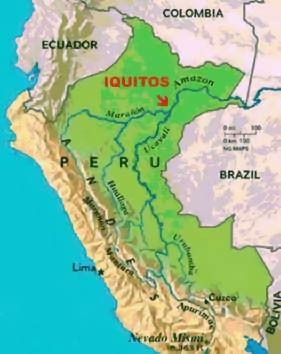 Over 100 miles from Iquitos in the Sucusari Nature Reserve is the privately-owned Plant and Animal Reserve and ExplorNapo Camp. 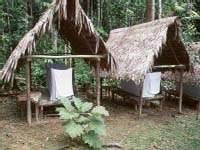 Very basic facilities do not disturb the flora or fauna of the area, which is why people choose to stay at ExplorNapo Camp. 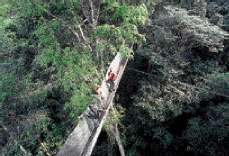 The longest treetop walkway in the world is at ACEER LAB encampment and Ethnobotanical Garden. The Canopy Walkway provides an experience unequaled in the rainforest! Reaching a height of up to 115 feet and extending over 1,700 feet, the walkway affords the best vantage points for observing wildlife and vegetation. The walkway is accessible to all and requires no special skills or equipment.